16 June 2018: UPS is buying a fleet of 1,000 electric vans from Workhorse. Parcel delivery companies are all starting to look at electric vehicles to reduce their operating costs and their impact on air pollution. 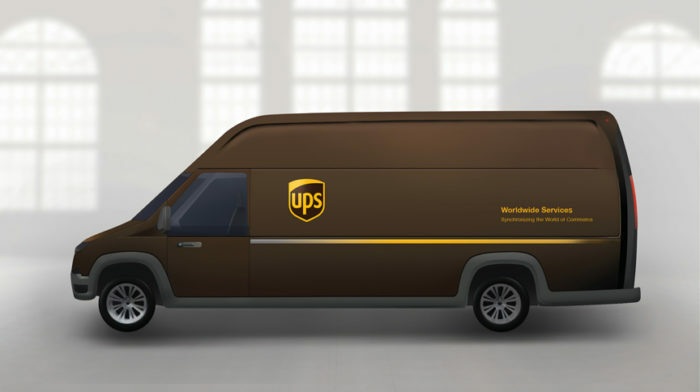 UPS is leading the way on that front as it orders a fleet of 1,000 electric vans from Workhorse as it latest electrification effort. The delivery giant is also working on several other electrification efforts. They are converting up to 1,500 delivery trucks to battery-electric in New York and they’ve already bought some of Daimler’s new electric trucks, and they’ve ordered 125 Tesla Semi trucks. 27 February 2018:UPS announced its plans to deploy 50 plug-in electric delivery trucks supplied by the Workhorse Group. UPS is collaborating with Workhorse to design delivery vehicles with zero tailpipe emissions. UPS will test the vehicles in urban areas across the U.S., including Atlanta, Dallas and Los Angeles. The vehicles will be delivered this year. The all electric trucks will deliver by day and re-charge overnight. Workhorse claims these vehicles provide nearly 400% fuel efficiency improvement as well as optimum energy efficiency, vehicle performance and a better driver experience. Each truck will have a range of approximately 100 miles between charges, ideal for delivery routes in and around cities. The class 5, zero emission delivery trucks will rely on a cab forward design, which optimizes the driver compartment and cargo area, increasing efficiency and reducing vehicle weight. The new trucks will join the company’s Rolling Lab, a growing fleet of more than 9,000 alternative fuel and advanced technology vehicles. UPS has more than 300 electric vehicles deployed in Europe and the U.S., and nearly 700 hybrid electric vehicles. The company recently ordered 125 new fully-electric Tesla Semi tractors to be built by Tesla in 2019. 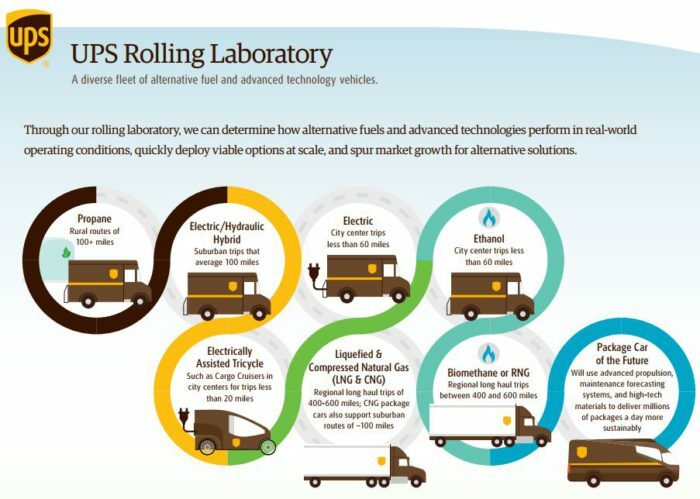 UPS operates one of the largest private alternative fuel and advanced technology fleets in the U.S. This includes all-electric, hybrid electric, hydraulic hybrid, ethanol, compressed natural gas (CNG), liquefied natural gas (LNG) and propane. Electric vehicles are not only zero-emission and quieter and more pleasant to drive, they also clearly lower emissions of the carbon dioxide linked to climate change under most circumstances. For fleet operators who recharge large fleets of electric vehicles overnight, however, the load on electric grids and consequent demand charges pose a significant concern. The solution to that is energy storage, in which large battery banks are steadily charged over the day, especially at times when energy is cheapest and perhaps greenest. The company will install Grid Energy’s Ingenium Universal Battery Energy Storage System, which dynamically moderates the charging to all vehicles connected to it. The system caps the peak load demanded from the electric grid by the depot and monitors the local substation to ensure that load doesn’t exceed preset levels. If the recharging vans demand more power than the grid can comfortably handle, the system blends in energy from the battery storage system. UPS, which operates one of the largest fleets of vehicles in the world, has several electrification efforts and today, it got quite excited about the prospect of going all-electric as it deployed a new smart-grid technology to support its growing EV fleet in London. So much so that it called it “breakthrough” that “signals the beginning of the end of a reliance upon traditional combustion engine powered vehicles.” They wanted to electrify the entire fleet, but they didn’t like the cost of charging high numbers of vehicles at the same time. In order to lower those costs, they developed a ‘Smart Electric Urban Logistics (SEUL)’ project with UK Power Networks and Cross River Partnership, with funding secured from the UK’s Office for Low Emission Vehicles. The delivery company currently operates 170 trucks out of its central London site and 65 of them are electric. UPS is also working on several other electrification efforts. They are converting ‘up to 1,500 delivery trucks’ to battery-electric in New York, they’ve already bought some of Daimler’s new electric trucks, and they’ve ordered 125 Tesla Semi trucks.